Grab your buddies, get your spandex on, and beat down some Monsters of the Week. 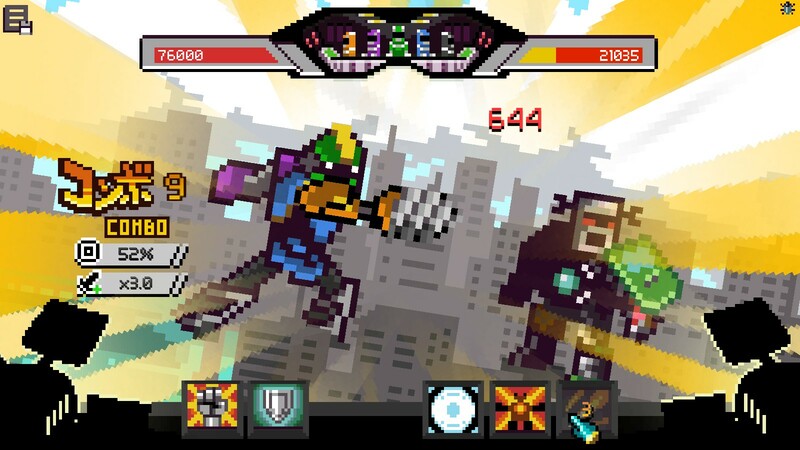 Welcome to Chroma Squad, the tactical RPG from Behold Studios, based in Brazil. This indie sensation puts you in the shoes of five stunt actors, all initially working for a Power Rangers-esque prime time show. Then they storm off set and proclaiming they can do better. Your goal: do just that. The game is mostly about turn-based strategy. There’s a tile-based field, an isometric perspective, your team, and a bunch of enemies you have to clobber over time. You’ll even encounter a familiar hierarchy of enemies, from your standard goons, to the big bosses with their own unique abilities. However, you can’t just head out from the get-go and beat up some people in cardboard boxes who are terrorising folks in quarries. You have to start with the basics first: setting up shop in your new home, a lowly warehouse loaned out to you with what few hundred dollars your team can spare. From there on Chroma Squad mixes in a light dusting of management sim throughout, with upgrades being available for your budding studio as well as your actors and their on-screen powers. Along with that, there’s a surprising chunk of inventory system involved, in the form of both a shop you can buy costumes and props from, and a crafting menu where you turn plastic and vinyl into TV magic. Being an avid fan of both Super Sentai and Power Rangers, I couldn’t help but smile all throughout playing this game. For me, shows like Super Sentai/Power Rangers succeed where I see others falter because they’re specifically aimed at kids and families. Yet by doing so, they take an approach that we attribute to Pixar quite a lot. They don’t talk down to their audience, which makes it more accessible for adults, while also keeping legacy fans who grew up enthralled as the years go by. For the most part, Chroma Squad fulfills a lot of this feeling. Coming Soon: Four Ladies and a ‘Bot! First of all, I have to give major kudos to Behold Studios for making this game incredibly inclusive. After the tutorial section, you actually get to customise your characters and make your dream team. The cast includes a wide variety, with plenty of people of colour and women to choose from. From my own perspective, since the game doesn’t ascribe gender to the characters, I played through believing half my team was non-binary. While the models and attributes themselves are fixed to specific characters, you can rename them and place them in any role you want between the Leader, Techie, Assault, Scout, and Support. As well as that, you can also choose the which colour ranger each character gets to be, with no limits. So no, Red doesn’t have to be the Leader, you can totally have Pink be the Assault, or even make an all-Silver team. You can even change the name, catch-phrase, and finisher phrase of the team. Maybe the world is finally ready for your all-pizza-themed superheroes? The gameplay itself is not very threatening to newcomers to the genre. The mechanics are simple enough and while the studio management portion is very crucial, it’s also fairly skin-deep. It’s just about bigger numbers, and you hit the upgrade cap a lot quicker than expected. The advertisement deals and crafting systems may be a little daunting at first, but so long as you pay attention you’ll get the hang of it soon enough. The combat is also fairly accessible, sometimes at the cost of being fairly repetitive and stretched-thin. However, the Director’s Orders mechanic will occasionally help plenty of players keep the combat fresh. This system gives you specific instructions that you must fulfil to gain more fans. Personally I would have preferred it if these were more optional, as the orders can usually lead to battles that drag on. 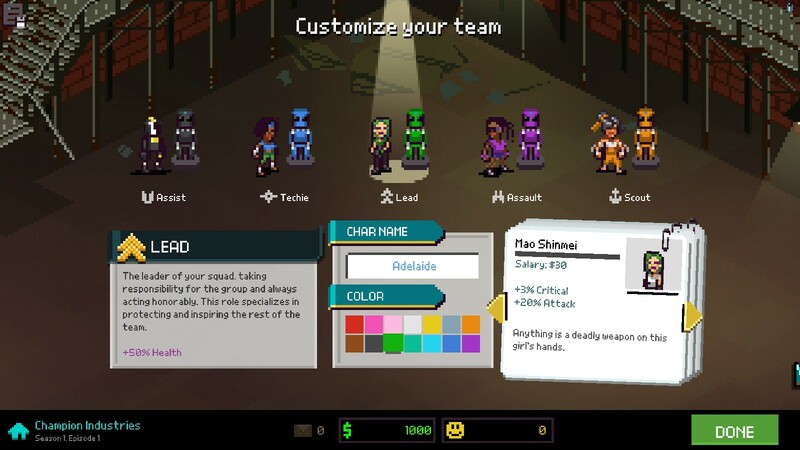 What helps separate Chroma Squad from the pack in one unique way is the mechanic of “Teamwork.” When activated, it ends that character’s turn, but now they can provide acrobatic boosts to far ends of the field for the group, and help provide team-up moves if attacking enemies while adjacent. This can even be stacked up to where you have the whole team perform a showstopping finisher. Let’s also not forget the mecha battles, the thing that puts the “super” in Super Sentai. Like equipment and weapon props, you can slowly upgrade your giant robot over time, while also building whole new components with different abilities that you can switch out at any point. I ended up going for a mecha with a lot of accuracy and lots of special attacks, but you can also opt for a more well-rounded spec, or even a heavy defence tank of a robot. Maybe you just want a mecha that hits really, really hard. Nobody would judge you. 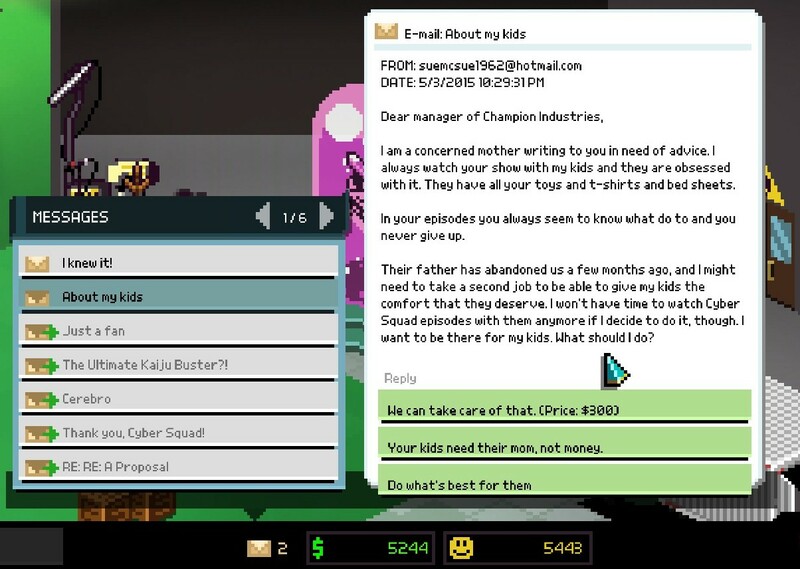 I love Chroma Squad. It’s not perfect, there’s no doubt about that. There are a lot of pop-culture and meme jokes that sometimes are a little too on-the-nose, the exposition can be a bit much, and some of the fights can just take way too long. That said, I was smiling all the way through. Every new monster was a joy, seeing new types of enemies show up unannounced made me bounce in my chair, upgrading weapons and making my team look fabulous gave me such glee. The story, as well, has a nice balance of being both fun and light-hearted, mixing in consequences one would expect to face as an aspiring studio of costumed fighters. For example, while it’s very stock-standard in terms of the underdogs making their way into the spotlight, I really appreciated that the characters had to deal with real life problems. Bills have to be paid, mobile phone plans have to be cancelled, one of the characters even sells their car to help support the show you’re creating. There are also egos, attraction between cast members, and fan mail to deal with. I actually found the fan mail the most surprisingly enjoyable section, where you can choose to respond to your emails in ways that can either benefit you in the short-term and long-term, negatively impact your fanbase, or even change the course of the plot. All in all, the game has plenty of little flaws, but as a whole it hammers down a theme I will always fight for: Love. Not just the romantic kind, but the sort of love you put into these shows; whether you’re a fan of many years, the parent buying your kids every toy, or even the actors themselves who want to make something special that speaks to people. Chroma Squad may not hit every cue perfectly, but in a way I’m glad it doesn’t. The shows that inspired it aren’t perfect, and because of that both them and this game shine beyond those cracks in a much more special way.